ULTIMATE FLOOR PROTECTION - Your Elf Certified Christmas Tree Mat was designed to keep your floors clean, dry, and scratch-free while looking beautiful and festive. With a THICK and WATERPROOF bottom layer, and an ABSORBTIVE top layer you can place and water your Christmas tree on any surface without worry. 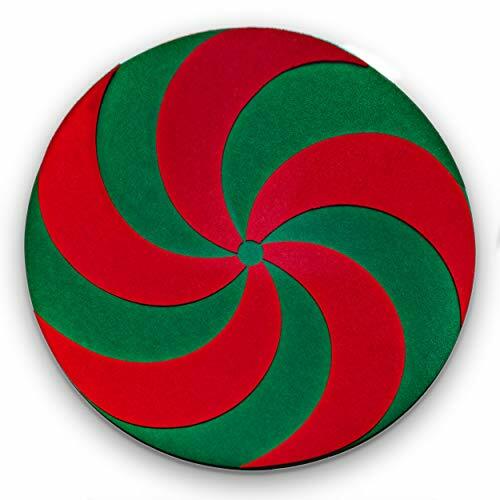 FESTIVE SWIRL DESIGN - With top quality felt, and a completely water-proof backing, your Christmas tree stand mat will enhance the beauty of your Christmas tree, and add festive flair. This is the Perfect Christmas tree mat for PROTECTING your HARDWOOD and CARPETED Floors. SUPER EASY CLEANING - DRIES FAST, and CLEANS EASY. Simply spot clean any dirt with a brush and cleaner. Make this one of your Charming Christmas tree accessories. IDEAL DIMENSIONS FOR YOUR CHRISTMAS TREE - With a DIAMETER of 30", you'll have ample room for your Christmas Tree Stand. SUPER SOLID, ENDURES YEAR AFTER YEAR - Your Elf Certified Christmas Tree Mat stands up to anything your family can dish out, and keeps coming back for more, year after year. Scratches to your floor and water spills can end up costing hundreds of dollars. Invest in our top-quality mat to save you future headache, time , and money, all while looking amazing!